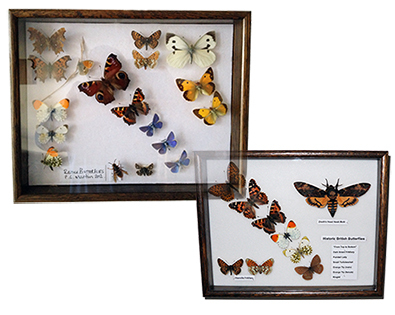 Though this website you can buy the full British Butterfly collection and my specially designed butterfly picture frames which are all subject to the natural England licensing laws. You will also find my tips and tricks page very useful whether your a novice or a seasoned professional. My interest in natural history and in particular entomology started from an early age at school and on holiday with my parents. 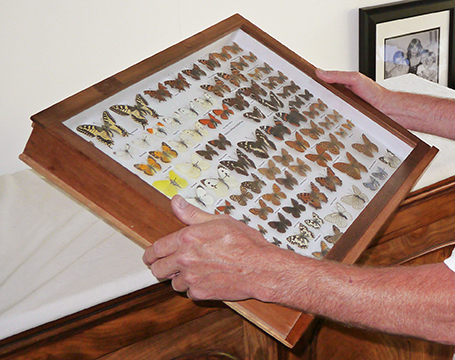 After a number of years buying and collecting specimens and taxidermy I visited Manchester museum and professor Alan Brindle who gave up his time to show me the Lepidoptera collections and also gave me a store box with a few "spare specimens". The order and quality of the moths and butterflies at Manchester museum was astonishing to such young eyes. I am a keen shooter and have a shoot in the lake district. Conservation of birds and animals is a priority and the benefit can be seen in the reduction of the introduced grey squirrel which allows are native red squirrel colony to survive. Due to vermin management we have a strong raptor population including peregrines, barn and tawny owls, kestrel and buzzards. I attend all the entomological shows, Newark, Kempton and the Derbyshire and Notts show where I sell books specimens and equipment. If you have a collection or just a few specimens for sale, I would be interested in giving you a free of charge evaluation for your consideration. If you require a specific historic specimen, I may be able to acquire that for you. I am also interested in collecting books, memorabilia and all types of entomological cabinets, storage boxes and drawers. I can also provide a full restoration service for cabinets, and can reline with cork or Plastazote to customers' requirements. Grading of collections, restoration, resetting and repinning of specimens. Preservation of labels by carding and research of collectors names to add provenance to your collection.